Tasty Palettes: What Could This Be? I have seen this in the produce aisle. It is some sort of citrus fruit but can't remember the name. OMG Suganya, Dont tell this is some edible fruit,pl....ease. Did one of the creatures on Star Wars lose their hand?? It's a Buddha-hand! I learned that last night on the Iron Chef. Ahh, educational television at it's best. I can honestly say I've never seen one before yesterday. I think those are Milagai Bajjis... Am I right? 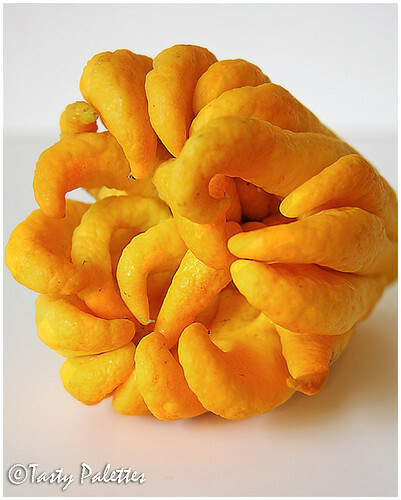 The "Buddha's Hand" lemon/ citrus fruit? I have seen it in Whole Foods and it looks perfectly other-worldly. Oh I've seen this at the farmers' market. A citrus fruit called someone's hand or someone's finger. Don't remember the exact name. skin looks like some citrous fruit but it can be a mushroom too!!! Beautiful but mysterious pic! is this somekind of a squash? Some kind of a citrus fruit. Glad to be the fist to guess. I guess this is the Octopus fruit from the citrus family also known as Buddha's Hand. Your blog is so lovely. I love your food pictures. Some kind of chilli pepper ? It's a lemon - a Bhudda's hand lemon perhaps? Can't recall exactly what they are called in these parts, but it's a citrus fruit for sure. Oh my goodness-Looks like a scary monster hand! I have no idea what it is--but great picture! Absolutely clueless..skin looks like tht of orange, but can't be..
My guess is some type of a squash? !